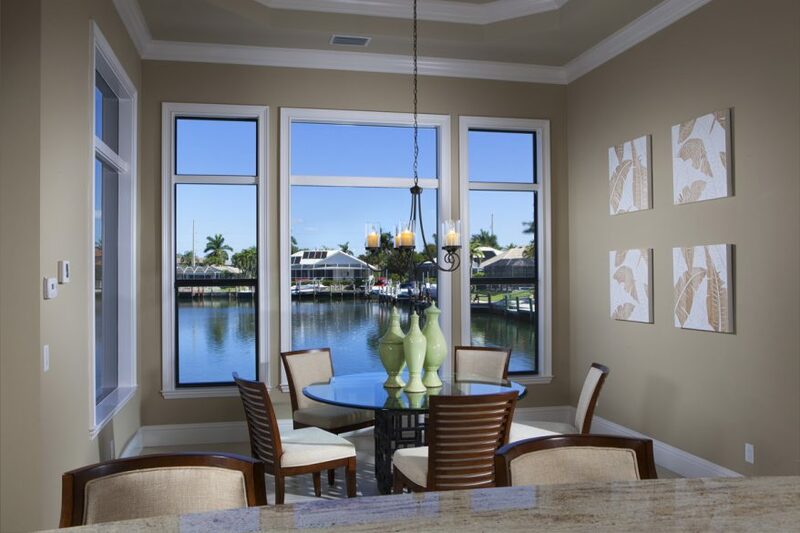 Three ways a waterfront house plan can enhance enjoyment of your lot - Weber Design Group; Naples, FL. Whether you’re planning to build on a coastal or lakefront lot, you have probably placed a high priority on taking full advantage of the fantastic views offered by your property. A waterfront house plan is one that has been designed to capture the best features of a lot on the water, and in some cases provide the additional structural integrity needed for a coastal home. Strategic placement of windows and glass doors as well as a thoughtful floor plan layout are the best ways that a waterfront house plan can maximize enjoyment of views. When choosing the home plan, you’ll want to consider the shape of your lot and the directions from which views are offered relative to window and door placement in the house. For a peninsula shaped lot, zero-corner sliding glass doors that pocket out of sight can be utilized in multiple areas to provide a 180 degree view of the water and create the illusion of a seamless indoor-outdoor transition. 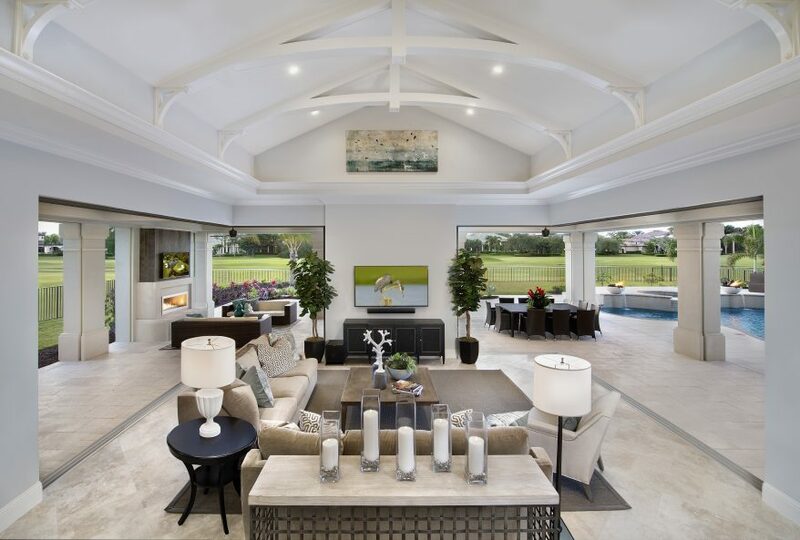 In this family room, zero-corner glass doors under a vaulted ceiling with beams makes a dramatic statement and takes in 180-degree golf course views. This seamless indoor-outdoor transition would work just as well for a waterfront lot. Mitered glass is also commonly used in spaces like bars and dinettes to allow for an omnidirectional view. Mitered glass used to expand a lakefront view from a sitting room. For a rear-oriented view, generous use of glass all along the back of the home can be achieved with a expansive wall of glass pocketing doors, large picture windows, French doors, mitered glass and more. The options are plenty for creative application of glass to bring your view and natural light inside. Here, a wall of pocketing glass doors disappear to reveal a wide-open waterfront view from the great room. Mitered glass in the dinette paired with a large wall of sliding glass doors in the family room. With so many great applications for windows and doors, it becomes just as important to have a floor plan that considers every angle from inside the home and minimizes the obstruction of the rear (and sometimes side) view wherever possible. Example of a floor plan with ample use of various types of glass windows and doors all along the back of the home to achieve a panoramic waterfront view. A layout that allows a direct view from the foyer to the rear of the home featuring walls of glass is ideal. Though there are endless options for bringing the outdoors in with glass and pocketing doors, we are sure you will still want to spend a great deal of time enjoying your view outside. Outdoor living areas are an essential part of any waterfront house plan, providing front row seats to gorgeous water vistas, and offering a wonderful space for casually entertaining family and friends. Breathtaking ocean view from a luxurious covered lanai. Covered lanais can be compact or expansive, and include luxurious appointments such as intricate ceilings, an outdoor kitchen, fireplaces or a full bar. Just beyond the outdoor living area, an infinity edge pool can showcase your view by appearing to spill into the water. Additional features like fire pits and beach areas can create a tropical oasis right in your waterfront back yard. In addition to the main lanai, many waterfront home plans also incorporate several balconies and private covered lanais from other rooms of the home. Are you ready to pair one of our waterfront house plans with your gorgeous lot? Of course every home site is unique, so remember that any stock house plans can be modified to better fit the view corridors of your individual property. Start browsing waterfront floor plans here.